Necrostatin: A Potentially Novel Cardioprotective Agent? Necrostatin-1 (Nec-1), a small tryptophan-based molecule, was recently reported to protect the cerebral cortex against ischemia-reperfusion (I/R) injury. We investigated the actions of Nec-1 and its so-called inactive analog, Nec-1i, in the setting of myocardial I/R injury. The actions of Nec-1 and Nec-1i were examined in cultured C2C12 and H9c2 myocytes, cardiomyocytes isolated from male Sprague–Dawley rats, Langendorff isolated perfused C57Bl/6J mouse hearts and an in vivo open-chest C57Bl/6J mouse heart model. Nec-1 at 30 μM and 100 μM (but not 100 μM Nec-1i) reduced peroxide-induced cell death in C2C12 cells from 51.2 ± 1.1% (control) to 26.3 ± 2.9% (p < 0.01 vs control) and 17.8 ± 0.9% (p < 0.001), respectively. With H9c2 cells cell death was also reduced from 73.0 ± 0.4% (control) to 56.7 ± 0% (30 μM Nec-1, p < 0.05) and 45.4 ± 3.3% (100 μM Nec-1, p < 0.01). In the isolated perfused heart Nec-1 (30 μM) reduced infarct size (calculated as a percentage of the risk area) from 48.0 ± 2.0% (control) to 32.1 ± 5.4% (p < 0.05). Nec-1i (30 μM) also reduced infarct size (32.9 ± 5.1%, p < 0.05). In anesthetized C57Bl/6J mice Nec-1 (1.65 mg/kg), given intraperitoneally to coincide with reperfusion following left anterior descending artery ligation (30 min), also reduced infarct size from 45.3 ± 5.1% (control) to 26.6 ± 4.0% (p < 0.05), whilst Nec-1i (1.74 mg/kg) was ineffective (37.8 ± 6.0%). Stimulus-induced opening of the mitochondrial permeability transition pore (MPTP) in rat cardiomyocytes, as reflected by the time until mitochondrial depolarisation, was unaffected by Nec-1 or Nec-1i at 30 μM but increased at 100 μM i.e. 91% (p < 0.05 vs control) and 152% (p < 0.001) for Nec-1 and Nec-1i, respectively. 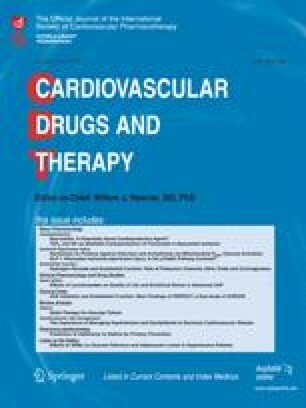 This is the first study to demonstrate that necrostatins inhibit myocardial cell death and reduce infarct size, possibly via a mechanism independent of the MPTP. This project was supported by a Programme Grant from the British Heart Foundation.